The majority of pre-sixteenth century homes are believed to have been made from wattle and daub with thatched roofs although it is very hard to prove when builders started using stone in our area given that so much stone was lying about and used for grander buildings. The local churches and castles were built from stone from at least the 12th century. Kirkby Stephen probably developed on a larger scale after the 1605 charter and especially when the Union of the Crowns brought safer times and cross border trade developed. The latter part of the 17th century after the English Civil War was also a great time of rebuilding and the period from which the majority of our early stone vernacular buildings date. You will see a number of 17th century date stones in Kirkby Stephen and the surrounding villages. Many of these stone 17th century buildings would have replaced or renovated earlier buildings. 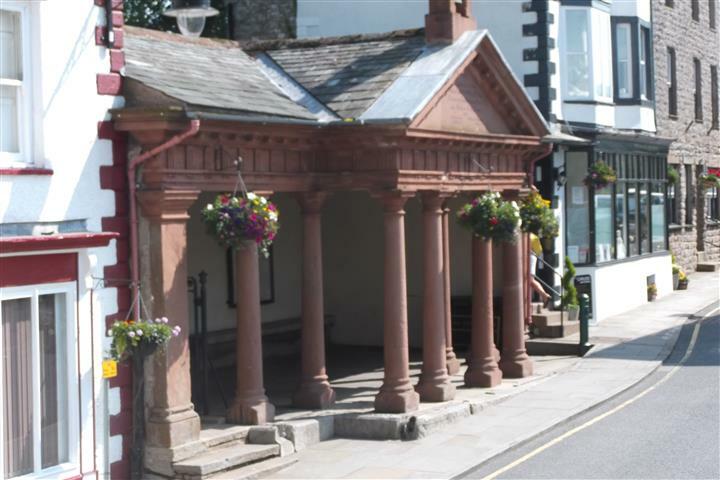 Trade developed in towns with a Market Charter like Kirkby Stephen with rented burgage plots. These were narrow buildings with a front onto the street for commerce, a barn behind for animal shelter and a strip of land to grow food or keep animals often in a collective system of shared crops. In those early days traders were also peasant farmers needing to grow food. These patterns can still be seen in Kirkby Stephen and Brough. Mallerstang is a linear village as populated by Norse settlers with longhouse farm settlements. These original longhouses were replaced by stone rubble longhouses in the 17th century and many still survive although increasingly modernised and extended. The longhouse characteristics are a single living room which is really a kitchen with sleeping areas and a barn attached for livestock. The animals generated heat in the winter to help keep warm. Bedrooms were later added in the loft space, when not used for hay, accessed by a ladder or outside staircase. Thatched roofs were replaced by sandstone flags and later Westmorland slate. This is a familiar farmhouse in our landscape. An improvement on a longhouse is a cross passage house where there is a passage between living quarters and the animals which helps to keep smells more distant. A cross passage house in Kirkby Stephen was extended in 1666 with a rear kitchen and staircase enclosed. The earlier medieval pattern windows later replaced with Georgian and then Victorian sash cord windows. It was also common to add a staircase at the rear and extend the roof over, this is called an outshut and there is an example of this type in Kirkby Stephen. You can tell the age and status of a building by the size, material and method of building. The earliest smaller and poorer houses are built of coursed stone rubble, Brockram, limestone and red sandstone as dug up or picked. These rubble houses were rendered with slaked lime mixed with horsehair with a yearly coat of white limewash. Later concrete render has been added and it is now the fashion to remove the render and point the stones. Next the houses built with some cut stones as decoration and to keep the building square by adding chamfered stone quoins, sills and lintels. These are often painted in our area and towards Penrith because they are made of porous sandstone which is easy to work but wears quickly. Houses built with all cut stones are generally later and grander. A fashion for stucco incised with lines over rubble to replicate dressed stone doesn’t fool many. We have looked at roof materials and brushed over local stone. Look closely at the walls in Kirkby Stephen and you will see a pinkish sandstone with small chunks of white limestone embedded, this local breccias is called Brockram mainly quarried from what is now Quarry Close and Birkbeck Gardens. There are similar deposits at Nateby but more commonly surrounding villages have red sandstone becoming increasingly dark towards Penrith. 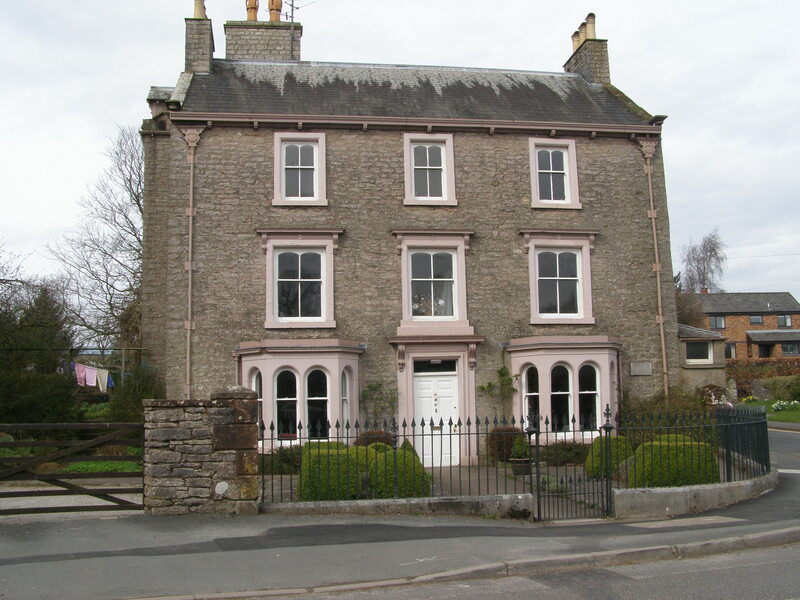 In Kirkby Stephen a lot of the houses are built of whitish free limestone from Fell End towards Sedbergh. This Limestone was available free to Kirkby Stephen residents but not allowed to be taken further as one man found to his cost when using this stone to build a house in Brough, he was charged for the stone used. Ravenstondale uses similar limestone. In what was Main Street Kirkby Stephen and Brough there are some quite grand houses which have additional local decoration. Stone copings run down the side of the roof and are finished with kneelers. 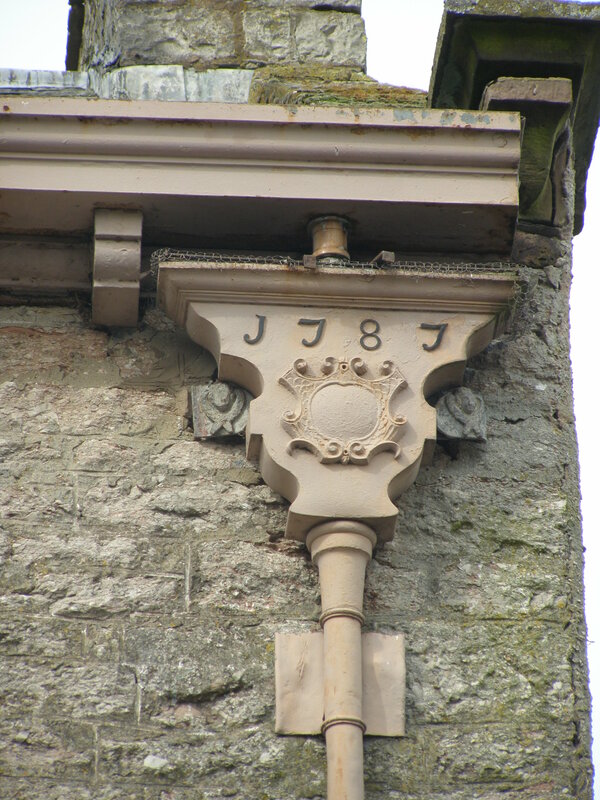 Cast iron rainwater heads are dated and often marked with the owners initials. Medieval window layouts have been replaced by Georgian and Victorian Neo-Palladian and Regency symmetrical layouts. Some rather grand porticos can be seen throughout the district on quite modest houses with the height of fashion to include a dated lintel with the husband and wife’s initials but not all are in their original places. Many larger houses and mansions began life as Peel Towers for defensive purposes and were added to when safer times came for better living conditions much like the Norman Keeps added grand halls within their curtain walls. 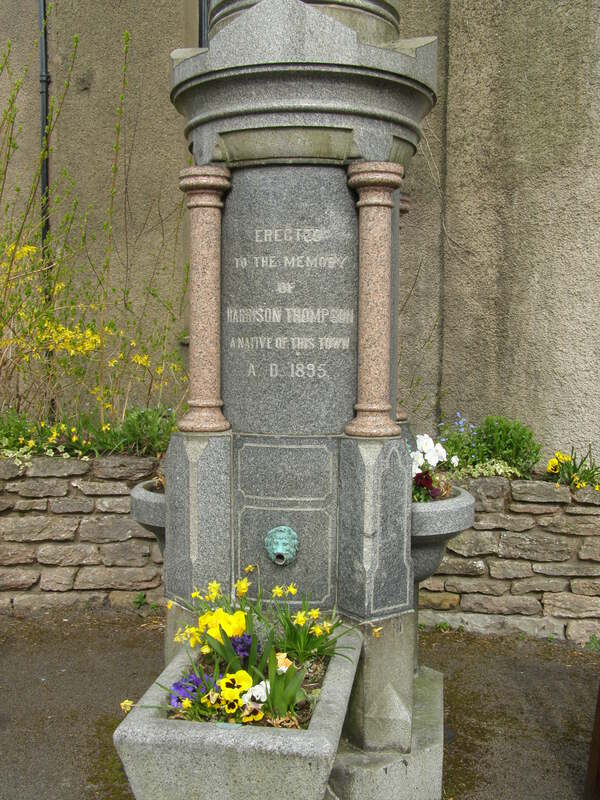 Well educated young people have through the centuries left the area to make their fortunes in London and Kirkby Stephen is full of reminders of their success having returned some of their wealth to the town. See The Cloisters bequeathed by James Waller and the old drinking fountain outside Silver Street gardens given by Harrison Thompson. There have been numerous grants and trusts. So as you walk around Kirkby Stephen Conservation Area on the Town Trail or on the Brough Buggy Walks or out in the villages, have a look at the rather beautiful vernacular architecture and try to decipher some of the history.